Mix the macaroni with water and salt in a microwaveable mug and heat for 2-3 minute. Add milk, salt, cheese, and pepper and microwave again for 30 seconds. Yummy Yummy Cheesiness! First, arrange salmon fillets in a microwaveable dish. Brush some oil over the salmon and add some garlic. Season with the salt and pepper to taste, cover and microwave on high for 1 to 2 minutes. Check the salmon to make sure it is cooked through and piping hot! Mix some cocoa powder and sugar in a mug. Add 2 tablespoons of water, enough to cover the powders. 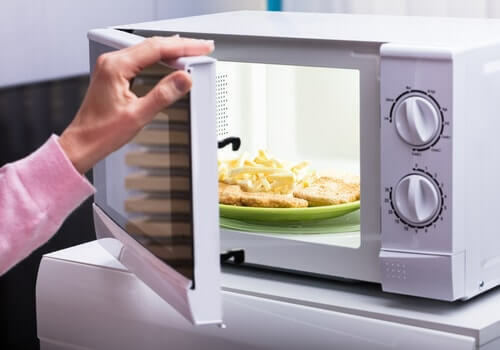 Microwave for 20-30 seconds. Add milk and microwave for an additional 40-60 seconds. For a little extra, you can add some vanilla extract and stir well. Comfort in a bowl! In a microwavable bowl, combine risotto rice and oil, add broth and 1 cup water to rice mixture and microwave on high for 9 minutes. Remove from microwave and let it stand for another 5 minutes. While the risotto is cooling, heat cubed squash in the microwave on high for 2 minutes. Add the cooked squash, salt, pepper, and cheese to risotto, stir well to combine and enjoy! Place the potato in the microwave and cook on full power for 9 minutes. Split the jacket potato in half, add Tuna, 1 tbsp reduced-fat mayonnaise and black pepper. Easy, peasy! Try these 5 meals and share with us your thoughts!